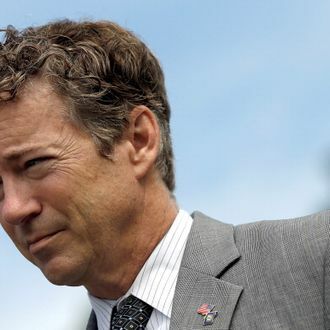 The Washington Times has put an end to Rand Paul’s weekly column after it emerged that the senator had used unattributed material from another publication in at least one recent installment. In announcing the decision, the Times reported that “the newspaper and the senator mutually agreed to end his weekly column,” which started over the summer. Neither Paul nor his fellow legislators will be banned from contributing to the paper after what editor John Solomon suggested was an isolated incident. “We expect our columnists to submit original work and to properly attribute material, and we appreciate that the senator and his staff have taken responsibility for an oversight in one column,” Solomon said. Paul has already promised to start footnoting his material “like college papers.” But the string of accusations isn’t over, as BuzzFeed’s Andrew Kaczynski on Tuesday found at least one more example of Paul apparently plagiarizing others’ material, lifting passages from a Forbes article to use in his 2012 book Government Bullies. In a meta twist, the entry for Paul on Wikipedia, which the senator was first accused of plagiarizing last week when he referenced Gattaca in a speech, now includes a couple of paragraphs on his ongoing plagiarism scandal. So Rand Paul Cribbed a Speech From Wikipedia’s Entry on Gattaca?